Dr Love is on his holidays again to promote his latest gambling experience. Join your favourite smarmy doctor on his psychedelic adventure into medicine and uncover the playing cards to win yourself some free games and healthy dose of cash. Dr love on vacation is a 5 reel, 25 payline online video slots game by microgaming. 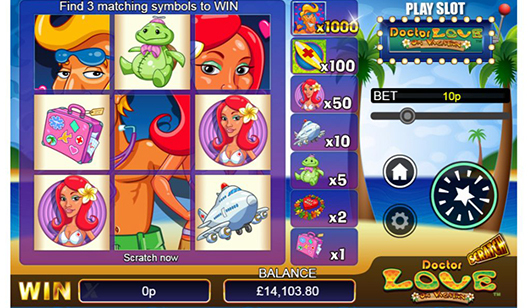 This slots game is the sequel to the original Dr love game, and its theme revolves around the doctor's trip to hawaii. Symbols in the game include the doctor himself, martini glasses, surf boards, suitcases and other holiday related things. Before playing the game, the player must set their wager. Starting from left to right, the first set of up and down arrows regulate coin size (ranging from 0.02 to 4). Next up is the “Clubs and Hearts” symbol, which consists of a carved image of each suit. This symbol is used to activate the gamble feature. Next to that is the ”Autoplay” button. This is used to set the chosen number of times for the reels to rotate automatically and without interruption. The “Play” button is used to start the game, and has a carved heart symbol on it. Dr Love on Vacation has a Wild Symbol consisting of the Doctor himself. This symbol can replace any and all symbols in the game excluding the Scatter Symbol. One reason that the Wild Symbol is so useful, is because it can form its own winning combination with as little as 2 of them on an active payline. The game's scatter symbol is a surfboard. Like the wild, it is possible to make a winning combination from as little as 2 of these symbols. The only difference being that the scatters can win from anywhere on the reels. All scatter wins are multiplied by the total stake, and if the player lands 3 or more Scatter symbols they will activate the free spin feature. Depending on the number of scatters you land, you could get up to 20 respins. If the player lands 3 scatter symbols, they will receive 12 free spins. 4 scatters awards 16 free spins, and 20 free spins grant the player 20 free spins. During a free spin, any winning combination that is hit is tripled. More free spins can be triggered during these spins by landing more scatter symbols. The gamble feature can be activated after any winning combo is landed. If the player chooses to gamble their winnings, they can do so my pressing the “Gamble” button. In order to win, the player must guess either the winning suit or colour of the next card. If you use the colour correctly you winings are doubled, and if you guess the suit correctly your winnings are quadrupled. The player is limited to 5 winning guesses before the feature is forced to end. The Feature will also end when the player guesses wrong, although this causes the player to also lose their winnings. 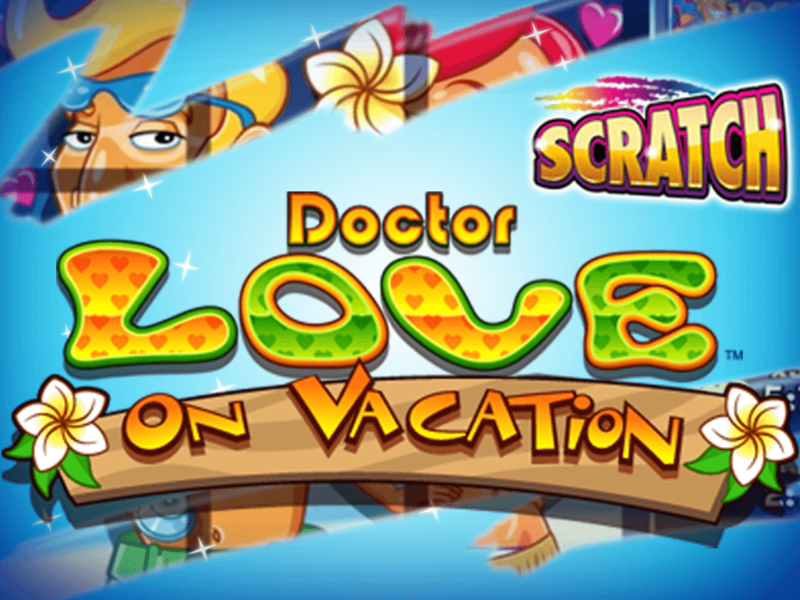 Doctor Love on Vacation is a fairly average game with an RTP (Return to Player) of 95.425%. I recommend this game for both beginners and seasoned slots players.